It's been such a long time since I participated in tags and memes so Emila's tag for me could not have come at a better time. On a quest to gather the longest possible list of bloggers from all around the world, Emila has tagged me with a really cool new meme, which is too good to pass! Plus, the dolly right next to Emila, the one in green is Mariuca with B right beside, how adorable is that? Of course I have to join such a cute fun meme! 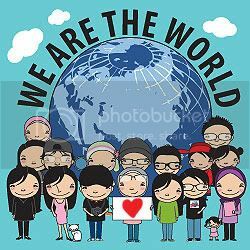 And it's really simple too so everyone should have some fun and spread love around the world with this We Are The World meme. I am inviting my friends LJ, Monica, Ane, Bem Bem, Debbs, Shemah, Kim, Roxy, Bill, Mize, Metz, Blue, Foong, ECL, Janice, Jean, Rozie, Bokjae, LR and everyone who would like to join me in this quest. Let's do this peeps and have fun! thanks for putting it up!! I hope we can gather as many as possible! So close right? I think only few secs apart woot! perasan or not the dolly in the green shirt is you?!!! and the dolly next to you is B with HRC shirt! but of course the HRC logo tu kecil sangat! He he cute right the dollies? Get one from emila if u like Mon! the globe oso not yet put at my blog Mariuca... hahhahhahahhah! haha yes la! i can give you the bigger copy of you and B if you want. just buzz me! Yay me wearing nice green shirt in the picture woo hoo! Thanks Emila, must include dat in my post now ha ha! Editing post…. LOL Mon! Got pink globe oso if u like he he! it's a fun tag and i'll try to do it when i have the mood. good night Marzie! I did the tag, remember that I tagged you for the BM one! Have a great week ahead, Marzie! Thanks for inviting me, I will sure join. I have another working week ahead but I´ll find some time to post it. Oh quite early, I slept about 7 hours after dat he he!! Ohhhhh no wonder la MIA Mon! Yum cheesecake! Oh u mean one of the many books R gave you? LOL! Which one did u read? wah, i oni have one Gucci Woman Perfume - EDP 50ml Spray! But the 4 in my collection are miniatures, cause I collect minis! He he! Ane don use oso, just display and happily smell away when I feel like it LOL!! Goin out for dinner now Mon, will post at MPG when I return, see ya! I also have Envy. I love that scent!!! Yelah.. natural smell but I love ENVY.. its light and refreshing.. !! Hehe.. Samsara you know lah kan..
Yay I have both Samsara and Poison! Awesome! Hey just started to rain here, perfect time to sleep! Huh? Got post at MPG later GP?? Yay to working from home so can sleep and enjoy the rain while other ppl go to work LOL!!! I lost my connection edi. Now I'm "sharing" with MNG.. lol! Yay for all perfumes in the world LJ!